HIDALGO — The RGV Dorados are returning home. Aleck Rios, marketing consultant for State Farm Hidalgo Arena, announce Friday morning that the Arena Football League II team that made its home in the arena from 2004 to 2009 was returning to play in the International Arena Football League, a new league that will have its inaugural season this year. The Vipers have a 10-game schedule for the 2019 season; seven of the games at home. The Dorados will play their opening game at 7 p.m., Monday, March 7 against the San Antonio Knights. Other teams in the league include the Austin Wild, Tamaulipas-Mexico Lagartos, Houston, the Temple Demons and Mexico City Mexicah. Bennie King will lead the team as coach and general manager, assisted by Robert Russell as assistant general manager and assistant coaches Mike Ochoa, Steven Jondreau, Fidel Garcia and former Dallas Cowboys’ quarterback Quincy Carter. 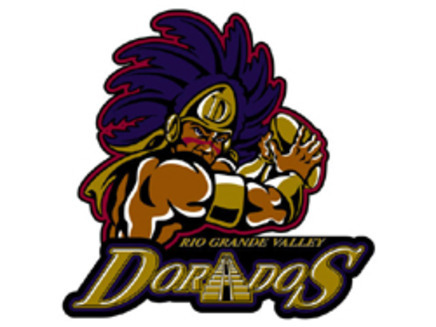 The Dorados originally began to play in 2004 as an expansion team of Arena Football’s AF2 league. After four successful seasons, including a 10-6 record in 2005 and a 15-1 mark in 2007, the only loss coming to Bossier-Shreveport. In six seasons, the Dorados went 57-45, before the team folded in 2009 after the dissolution of the AF2. Monday, March 4 vs. San Antonio Knights; Saturday, March 9 vs. Austin Wild; 7 p.m. Wednesday, March 27 vs. Tamps-Mex Lagartos; Saturday, April 13 at Tamps-Mex Lagartos; Sunday, May 5 vs. San Antonio Knights; Saturday, May 11 vs. Mexico City Mexicah; Saturday, June 1at Mexico City Mexicah; Saturday, June 8 vs. Temple Demons; Saturday, June 15 vs. Houston; Saturday, June 22 at Houston.